Science's Elusive Realm: Life's Little Mysteries. (Science Desk) Sandra Blakeslee. Physicists observe the natural world and extract from it laws and principles that reliably explain everyday phenomena. At the smallest scale, they use quantum mechanics to predict the behavior of subatomic particles and small molecules. At larger scales, they devise theories to explain magnetism, the conduction of heat and electricity and other phenomena that occur the same way in a wide variety of materials. Scientists boast that these principles predict how most matter will behave in physical and chemical experiments. But there is one region that eludes them. That is the region containing matter on a scale of 10 to 1,000 angstroms (an angstrom being one billionth of a meter) -- bigger than a simple molecule but smaller than a living cell. This is the realm in which the constituents of cells interact with one another. It is where proteins fold, charged ions move through cell membranes and messenger molecules read DNA instructions in the cell nucleus. Even the most advanced microscopes can only glimpse this activity, because the energies they use tend to destroy living tissue, said Dr. David Pines, a physicist at the Los Alamos National Laboratory. At this level, things do not act according to well-described theories of chemistry and physics. Rather, systems this size seem to obey a unique set of rules that cannot be deduced from studying their individual components. There are too many atoms in the systems to be described by electromagnetism and quantum theories but too few to handle statistically. This is the realm of ''the mesoscale,'' and scientists like Dr. Pines and Dr. Robert Laughlin, the Nobel laureate from Stanford, are attacking its mysteries. Work has begun under the auspices of the Institute for Complex Adaptive Matter or ICAM, a new and independent unit of the Los Alamos National Laboratory and the University of California at Berkeley, which administers the lab. Led by Dr. Pines and Dr. Laughlin, the physicists, chemists and biologists of ICAM met here this year to discuss how scientists might try to understand and maybe even design matter that organizes itself into living systems. Unlike the Santa Fe Institute and other centers that study complexity, ICAM scientists tend to shun computer models and the jargon of complex systems. Nor do they have much faith in efforts to understand life by sequencing genes and looking for similar patterns in different organisms. Without deeper organizing principles, they say, the mere accumulation and organization of genetic data will not shed light on how life works. As an example, he cites 19th century physicists who believed light needed some kind of medium, called ether, to spread through the universe. But this wholly fabricated invention was overturned when Albert Einstein accepted at face value experiments that found light travels at a constant speed and ''went on to make his astonishing predictions about the dilation of time and the equivalence of mass and energy, both of which have now been verified in countless experiments,'' Dr. Laughlin said. Nanotechnology is exploring matter at the mesoscale and holds promise for discovering new principles, Dr. Laughlin said. But until it develops some theories, it will not be able to test new ideas about how living systems are organized. Mathematicians are beginning to make important contributions that help model and understand biological systems, he said, but laboratory experiments still need to guide their thinking. To start with, ICAM researchers are focusing on one beguiling fact: complex systems can arise out of simple constituents that interact with each other in ways not necessarily obvious. In Dr. Laughlin's view, life is constructed according to engineering principles or laws that do not change, though they are observed at different scales under different conditions, Dr. Laughlin said. For example, the laws of hydrodynamics -- the science that deals with the motions of fluids and the forces acting on solid bodies immersed in fluids -- are the same in a wide variety of materials. Do these so-called ''protected'' laws exist at the mesoscale? No one attending the ICAM meeting claimed to have the answer. But they discussed a variety of ways to find out. One approach involves studying the way small molecules called amino acids fold themselves up to make functional proteins. When a gene directs messenger RNA to make a protein, it activates machinery that produces a linear chain of amino acids that code for the protein. Scientists used to think that the same linear sequence of amino acids always led to the same protein, said Dr. Peter Wolynes, a chemist at the University of California at San Diego. They also thought that proteins followed more or less the same course when they folded. But now, Dr. Wolynes said, scientists know that a huge variety of amino acid sequences can fold up to form the same protein. Moreover, the same string of amino acids folded differently creates a protein that acts differently in the body. These findings have turned protein folding into one of the most intractable problems in biology. For example, a big protein like myoglobin, the iron-bearing pigment in muscles, can be made by any one of many millions of different amino acid sequences. What makes a protein follow one of these many folding possibilities to achieve its functional shape? The answer, Dr. Wolynes said, lies in what he and other researchers call ''funnels'' in the multidimensional landscape of folding possibilities. Like real funnels that force material to flow in one direction, protein funnels are produced when amino acids try many different configurations and are drawn by an interplay of positive and negative forces to flow or fold in one direction. But the detailed physical interactions that may create these funnels are not well understood. 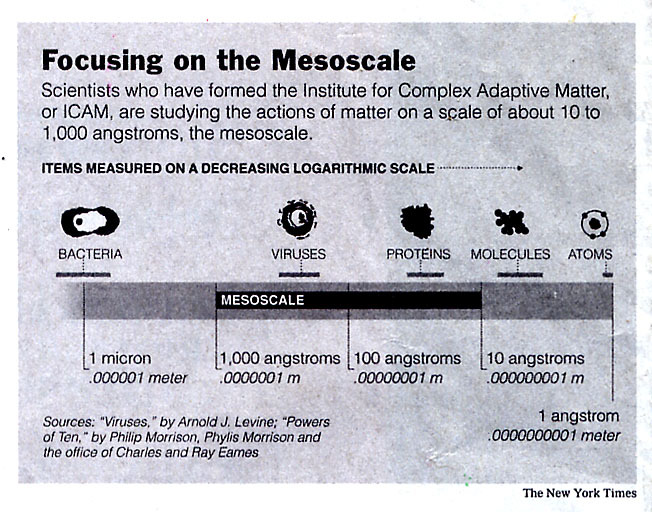 Dr. James Shapiro, a professor of microbiology at the University of Chicago and an ICAM researcher, said that interactions among components in a system were the keys to understanding the emergence of complex systems. These interactions include dynamic properties like feedback and checkpoints, at which the system checks to make sure everything is all right, which are seen everywhere in living cells, he said. All kinds of signals inform cells where they are at a given time, where their neighbors are, what they are supposed to do next and how and when to stop, Dr. Shapiro said. Feedback and control are processes that lead to protected states in the mesoscale, which need to be explored experimentally. Dr. M. Reza Ghadiri, a chemist at the Scripps Research Institute in San Diego has in his laboratory created small systems of organic molecules that faithfully make copies of themselves and use feedback to change their dynamics. These molecular ecosystems are not life, he said, but they do show emergent properties like the ability to reproduce, form parasites, correct errors and engage in symbiosis. Dr. Laughlin challenged biologists to double-check some of their classic experiments used to explain how DNA works at a molecular level. For example, many details of accepted theories of how DNA actually makes proteins are ''appallingly bad,'' he said. ''I've just written a paper on this subject, which is considered nutty by many experts and visionary by others,'' he said. He said it would be published soon in The Proceedings of the National Academy of Sciences and added that he welcomed vigorous debate about it. At Harvard, Dr. George Whitesides is experimenting with magnetite and iron beads to explore how forces of repulsion, attraction and energy dissipation interact to form unpredictable complex patterns. As these simple systems evolve, Dr. Whitesides said, it should be possible to explore the dynamics of interacting particles and perhaps model biological principles. ''We are letting nature tell us what it likes to do,'' he said. Such experiments have extraordinary implications, Dr. Pines said. Unlike vitalism -- a doctrine that says the processes of life are not explicable by the laws of physics and chemistry alone and that life is in some way self-determining -- the research into complex adaptive matter says that life is the consequence of molecular interactions.